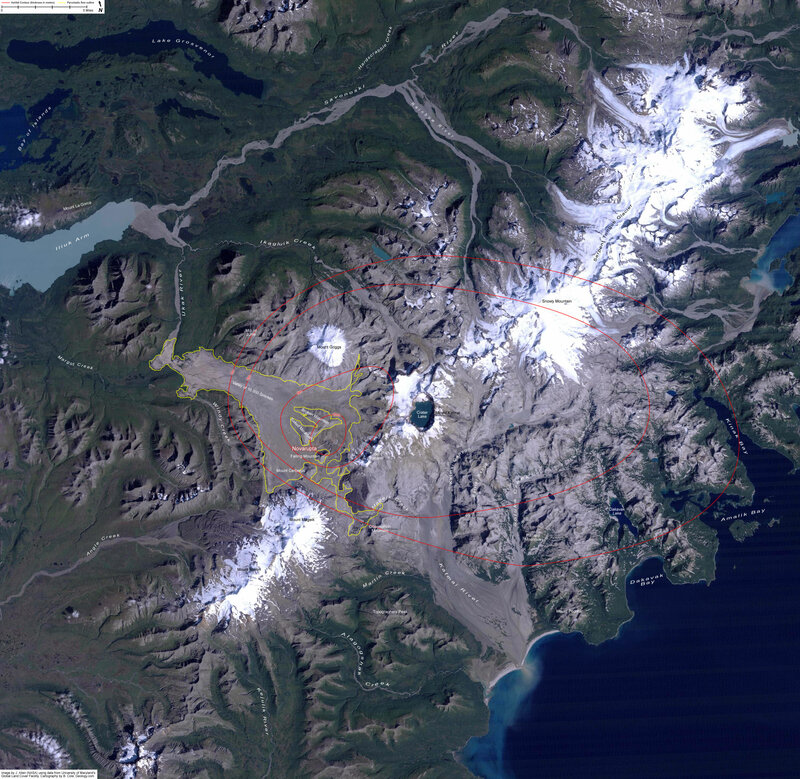 Novarupta map: Approximate location of the June 6th, 1912 eruption. Ash fell on the town of Kodiak for three days, and although the town was about 100 miles from the volcano, it was covered with over one foot of ash which collapsed many buildings. Map by Geology.com and MapResources. Today the stirring of an important volcano draws enormous global attention. Weeks or even months before most large eruptions, a buzz circulates through an electronically connected community of volcano scientists as clusters of small earthquakes are detected by a global array of seismographs. Many scientists working at diverse global locations interpret this data and begin to collaborate about an awakening volcano and the eruption that might follow. Reports are posted on the internet, and news stories communicate the volcano's activity to millions of people. Often it is a false alarm – the volcano is simply stirring. However, in 1912, Alaska was not a U.S. state, very few scientists were supported to do volcanic studies, and a worldwide network of seismic monitoring was not in place. Scientists were just starting to understand the mechanics of volcanic eruptions. The relative size of the Novarupta eruption compared to other volcanoes on the basis of cubic miles of magma ejected. Novarupta was rated VEI 6 on the volcanic explosivity index. USGS Image. On June 6th, 1912, a tremendous blast sent a large cloud of ash skyward, and the eruption of the century was underway. People in Juneau, Alaska, about 750 miles from the volcano, heard the sound of the blast – over one hour after it occurred. For the next 60 hours, the eruption sent tall dark columns of tephra and gas high into the atmosphere. By the time the eruption ended the surrounding land was devastated, and about 30 cubic kilometers of ejecta blanketed the entire region. This is more ejecta than all of the other historic Alaska eruptions combined. It was also thirty times more than the 1980 eruption of Mount St. Helens, and three times more than the 1991 eruption of Mount Pinatubo, the second-largest in the 20th Century. 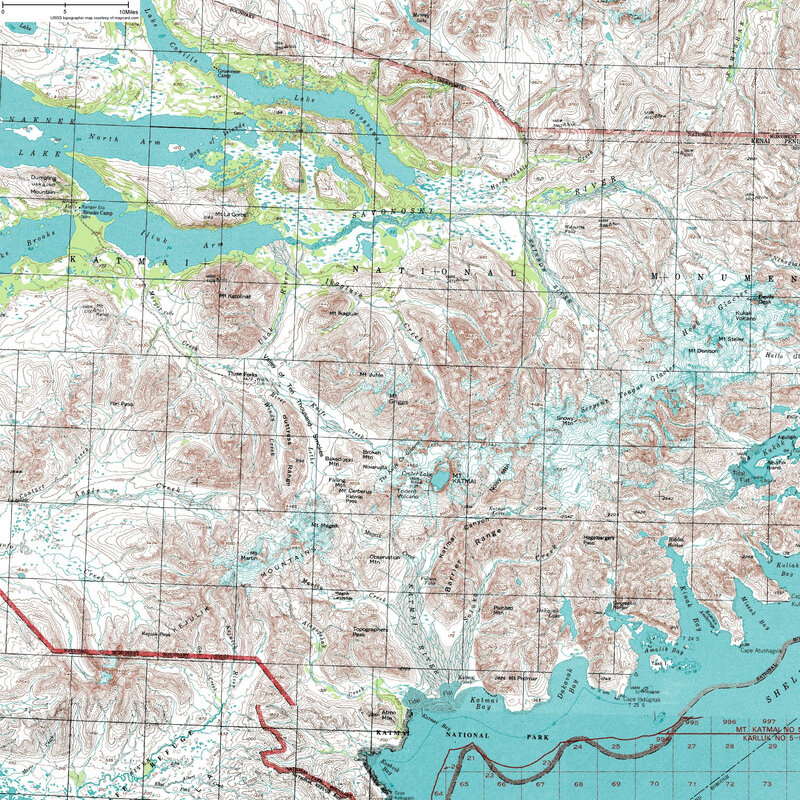 Novarupta topo map: USGS Topographic Map of the Novarupta/Katmai Area by MyTopo.com. Click to Enlarge. 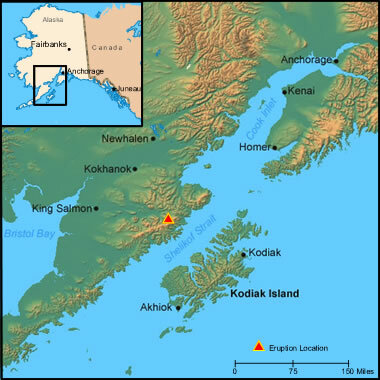 The inhabitants of Kodiak, Alaska, on Kodiak Island, about 100 miles away, were among the first people to realize the severity of this eruption. The noise from the blast would have commanded their attention, and the visual impact of seeing an ash cloud rise quickly to an elevation of 20 miles then drift towards them would have been terrifying. Within just a few hours after the eruption, a thick blanket of ash began falling upon the town - and ash continued falling for the next three days, covering the town up to one foot deep. The residents of Kodiak were forced to take shelter indoors. Many buildings collapsed from the weight of heavy ash on their roofs. Outside, the ash made breathing difficult, stuck to moist eyes, and completely blocked the light of the sun at midday. Any animal or person who was caught outside probably died from suffocation, blindness, or an inability to find food and water. Novarupta pyroclastic flow and ashfall: Satellite image of the Novarupta / Katmai area showing the geographic extent of the pyroclastic flow (yellow) and ash deposit contours (red). 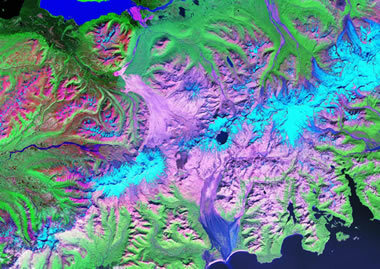 Image by J. Allen (NASA) using data from the University of Maryland’s Global Land Cover Facility. 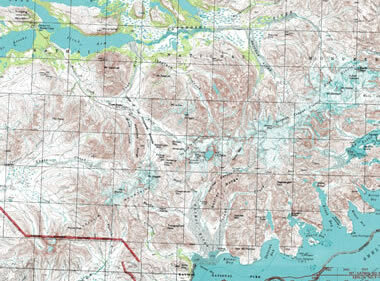 Cartography by B. Cole, Geology.com. 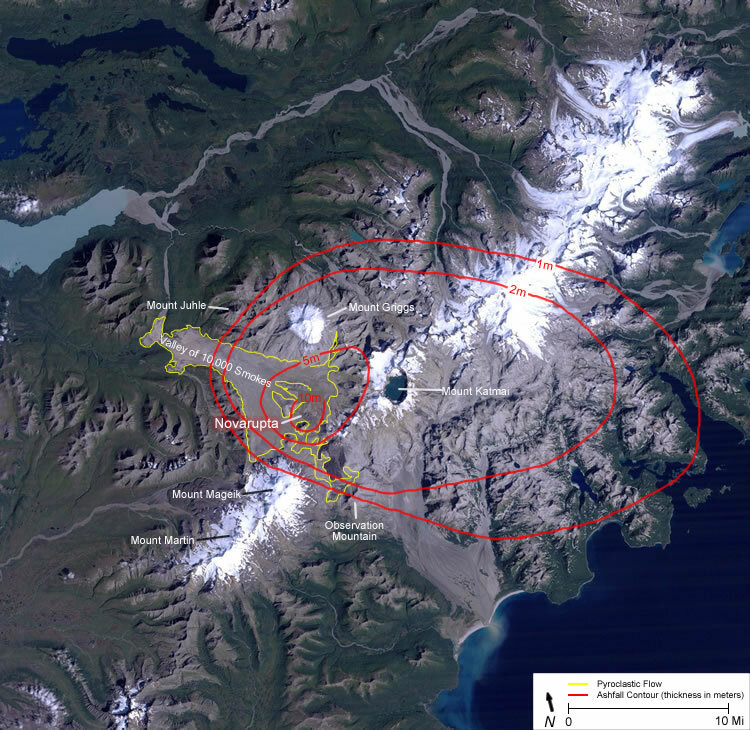 The distribution of ash and the pyroclastic flow confirms that Novarupta - and not Katmai - was the source of the eruption. Medium Resolution 164 KB. High Resolution 1330 KB. Ash from Alaskan volcanoes: Ash fall extent map of Alaska volcanoes. Image from USGS Fact Sheet 075-98. Although the eruption had these far-reaching effects, most people outside of Alaska did not know that a volcano had erupted. More surprising is that no one knew for sure which of the many volcanoes on the Alaska peninsula was responsible. Most assumed that Mount Katmai had erupted, but they were wrong. Valley of Ten Thousand Smokes. Photo taken in 1991 by R. McGimsey, U.S. Geological Survey. The valley was filled with hot pyroclastic debris and emitted steam from thousands of vents for years after the eruption. 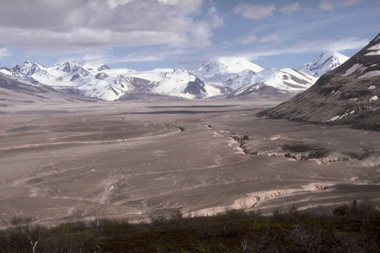 First, the valley of Knife Creek was now barren, level, and filled with a loose, sandy ash which was still hot at depth. Thousands of jets of steam were roaring from the ground. Griggs was so impressed that he called it the “Valley of 10,000 Smokes”. 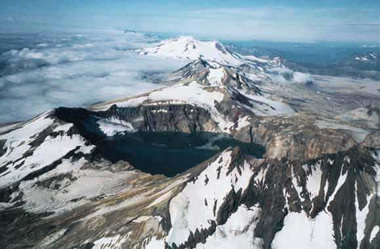 Katmai crater: Katmai Caldera was originally thought to be the source of the blast. But about 40 years later the source was finally attributed to Novarupta. Image by USGS. Novarupta Lava Dome marks the source of the 1912 eruption. Image by USGS. During the eruption a large amount of magma was drained from magma chambers below. The result was a removal of support from beneath Mount Katmai, which is six miles from Novarupta. The top several hundred feet of Katmai - about one cubic mile of material - collapsed into a magma chamber below. This collapse produced a crater about two miles in diameter and over 800 feet deep. 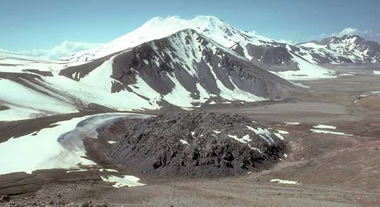 Early investigators assumed that Katmai was responsible for the eruption. 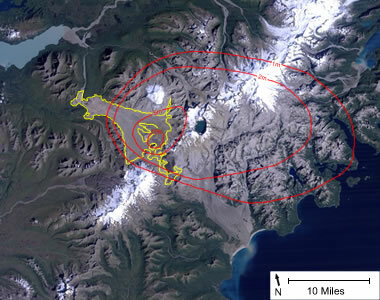 This assumption was based upon Katmai being near the center of the impact area, Katmai was visibly reduced in height, and early witness accounts thought that the eruption cloud ascended from the Katmai area. Closer observation was not possible, and expeditions into the impact zone would be very difficult to accomplish. Novarupta location: Novarupta was a very high latitude eruption. Recent studies have linked high latitude volcanic eruptions with altered surface temperature patterns and low rainfall levels in many parts of the world. 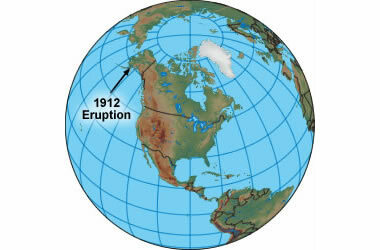 The 1912 eruption of Novarupta and other Alaskan volcano eruptions have been linked with drought and temperature changes in northern Africa. Large eruptions of Novarupta's scale at high latitudes can have a significant impact upon global climate. Recent studies have linked high latitude volcanic eruptions with altered surface temperature patterns and low rainfall levels in many parts of the world. The 1912 eruption of Novarupta and other Alaskan volcano eruptions have been linked with drought and temperature changes in northern Africa. Another significant impact is the distribution of volcanic ash. The illustration on this page shows the ash fall impact areas for five important volcanic eruptions of the 20th century. Augustine (1976), St. Helens (1980), Redoubt (1990), and Spurr (1992) all produced ash falls of significant regional impact. However, Novarupta's ash fall was far greater than any other Alaska eruption in recorded history and contained a greater volume than all of the Alaska eruptions which have been recorded combined. One of the most important reasons to monitor volcanic eruptions is the potential danger that they present to commercial air traffic. Jet engines process enormous amounts of air, and flying through finely dispersed ash can cause engine failure. Impacting the tiny ash particles at high speed is very similar to sandblasting. This can "frost" the jet's windshield and damage external parts of the plane. Before the danger of flying through finely dispersed ash was appreciated, several commercial jets were forced to land after sustaining serious damage while in the air. Eruptions the size of Spurr, Augustine, Redoubt and St. Helens can damage jets flying over 1000 miles away. An eruption the size of Novarupta would ground commercial jet traffic across the North American continent. Landsat image of Novarupta: Landsat satellite image of the Novarupta / Katmai Area. This image shows that ash from the eruption still blankets the landscape nearly 80 years later. Higher Resolution. People cannot prevent this type of eruption. They can assess the potential impact, develop with the possibility of loss in mind, plan a response, educate the public and key decision makers, and monitor the region where it might occur.